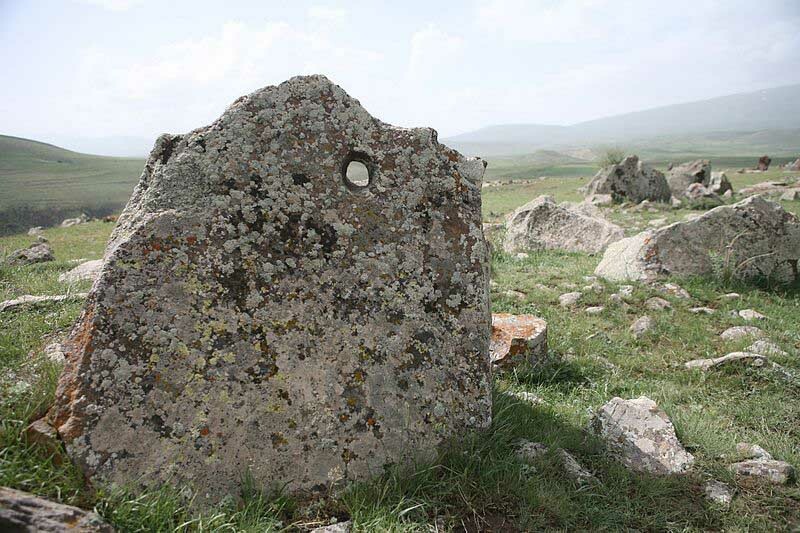 Zorats Karer , also called Karahunj or Carahunge, is an archaeological site near the city of Sisian in the Syunik province of Armenia. The site is located on a rocky promontory near Sisian. About 223 large stone tombs can be found in the area. It was explored by a team of archaeologists from the Institut fur Vorderasiatische Archaologie, University of Munich who published their findings in 2000. 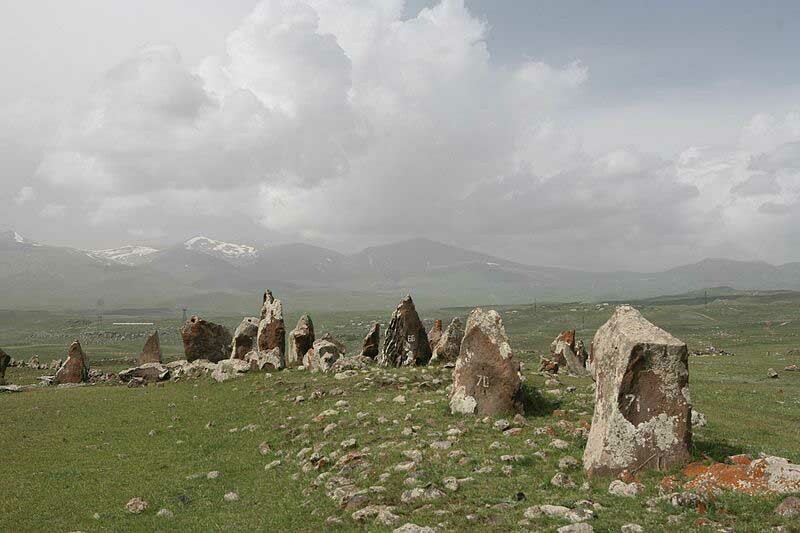 They concluded that "in contrast to the opinion that Zorakarer may be called an Armenian Stonehenge", Zorats Karer "was mainly a necropolis from the Middle Bronze Age to the Iron Age." The Munich archaeologists add that it may have served "as a place of refuge in times of war", possibly in the Hellenistic - Roman period (c. 300 BC - 300 AD). A wall of rocks and compacted soil (loam) was built around the site with vertical rocks plugged into it for reinforcement: today only these upright rocks remain. About 84 of the stones feature a circular hole, although only about 50 of the stones survive. 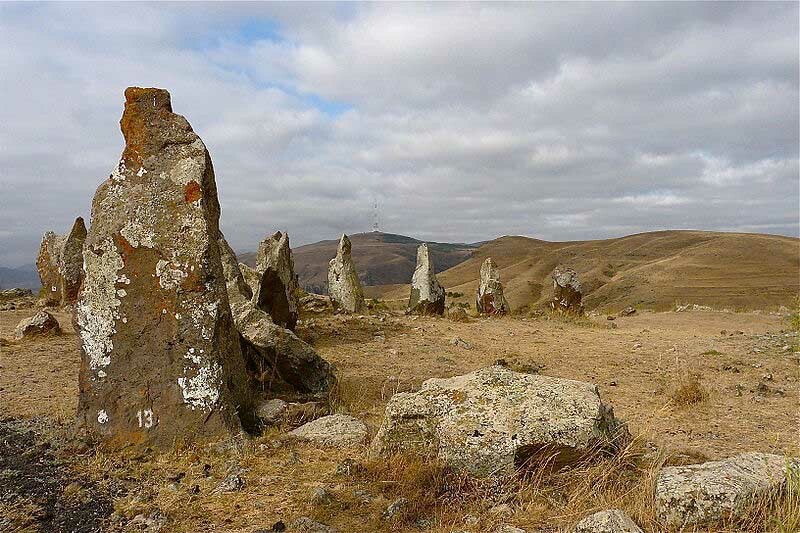 They have been of interest to Russian and Armenian archaeo-astronomists who have suggested that the standing stones could have been used for astronomical observation. This suggestion was made by observers who noted four stone holes which could be claimed to be sighted at the point on the horizon where the sun rises on midsummer's day. Four others standing stones display holes which observers claimed point where the sun sets on the same day. However, this must remain conjectural as the holes are relatively unweathered and may not even be prehistoric in origin. 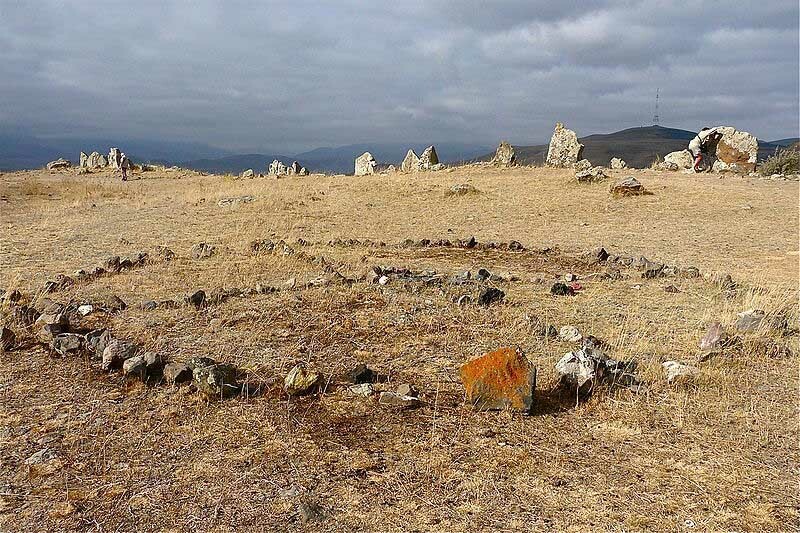 In the nearby city of Sisian, there is a small museum dedicated to findings in the area, including paleolithic petroglyphs found on mountain tops in the area, and grave artifacts form the Bronze Age burial site with over 200 shaft graves. In 2004 the site was officially named the Karahunj (Carahunge) Observatory, by Parliamentary decree (Government decision No. 1095-n, July 29, 2004). There have been several research expeditions to study Zorats Karer over several decades. The most extensive research has been carried out by Paris Herouni and by Elma Parsamyan of Biurakan Observatory. According to Herouni, the site was "a temple with a large and developed observatory, and also a university". He thinks that the temple was dedicated to the Armenian sun-god Ari. He made a survey of the site and claimed it was 7600Ð4500 years old. Herouni has proposed a further hypothesis, that some stones of the monument mirror the biggest star of the Cygnus constellation - Deneb. A stone discovered in Gobekli Tepe in modern Turkey excavated by German archaeologist Klaus Schmidt, shows the map of the night sky (Cygnus constellation), which in the Karahunj monument, as V. Vahradyan noticed, represents the same constellation, mirroring the Zorats Karer site.